"Standards tell what students should know and be able to do, but do they tell how to use this power, change the world and make a difference?" In an ideal world, we'd all love our students to ace quizzes and tests, get their homework in on time, and generally demonstrate good student skills. Every year I have wave after wave of students that are so keen on that coveted A+ but they don't really ask themselves what they'll do with this knowledge and skill set that they have learned. I like to think that learning should have applications and I'm not denouncing the need for good assessment habits, but if they're learning merely to pass a test, how can they enjoy a love of learning after they leave that educational system? How can we develop curiosity? The emphasis on standardized testing as the bottom line in education is proving this point. Although these are good indicators of student learning, they omit the applications of this learning and don't allow students to show why they are learning it in this first place. 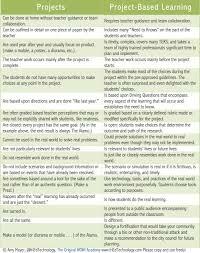 This is the allure of having "projects" but these are often "add ons" rather than an authentic learning experience.